RIO DE JANEIRO, Feb 2 2018 (IPS) - The war in Angola, the earthquake in Haiti, Venezuela’s political crisis and shortages and the political repression in the Democratic Republic of the Congo are the main driving factors behind the recent waves of immigration to Brazil. The largest and most populous Latin American country is no longer the major recipient of immigrants that it was until the mid-twentieth century, which gave it its well-known ethnic and cultural diversity, with large European, Arab and Asian inflows. Brazil, with a current population of 208 million inhabitants, had only 713,568 foreign residents in 2015, equivalent to just 0.3 percent of its population at that time, according to the World Migration Report 2018 published in December by the International Organisation for Migration (IOM). Almost nothing compared to Argentina and Venezuela, where immigrants represent 4.5 and 4.8 percent of the population, respectively, IOM Brazil project coordinator Marcelo Torelly told IPS. But Brazil again became an attractive destination this century, especially in the current decade, when the number of foreign-born inhabitants grew 20 percent from 2010 to 2015, according to the IOM. “The main flow of immigration is now South-South from Haiti, Africa and Asia, not the flows from bordering nations, and surpassing those from the North,” academic Leonardo Cavalcanti, scientific coordinator of the Observatory of International Migration (OBMigra), a joint studies group of the Ministry of Labour and the University of Brasilia, told IPS. There was an upsurge after the January 2010 earthquake in Haiti, which claimed more than 220,000 lives, displaced 1.5 million people and destroyed the local economy. Tens of thousands of Haitians sought a chance to rebuild their lives in Brazil, making up the largest foreign group in the formal labour market since 2013. Brazil already had close relations with Haiti prior to the earthquake. In addition to sending thousands of soldiers and being in charge of the military command of the multinational United Nations peacekeeping mission in Haiti, MINUSTAH, between 2004 and 2017, it also carried out social projects in the Caribbean island nation. Among the Brazilians killed in the earthquake was Zilda Arns, who brought to Haiti the experience of the Pastoral Care of Children, a Catholic organisation that she founded, and which was instrumental in reducing child mortality in Brazil. Bob Montinard, a 42-year-old Haitian, was working in Port-au-Prince on disarmament, conflict mediation and reintegration projects for juvenile offenders after their release, promoted by the U.N. and the Brazilian non-governmental organisation Viva Río, when the earthquake destroyed his house and his left leg was broken as debris fell. Surgeries in France and the need for ongoing physiotherapy made him decide to move to Río de Janeiro, where he has lived since 2010 with his French wife and their children aged eight and nine, as a cultural producer and activist. Last year he founded an organisation called Mawon, which in the Haitian Creole language means chestnut colour but was also the name given to black slaves who fled to freedom, like the “quilombolas” in Brazil. 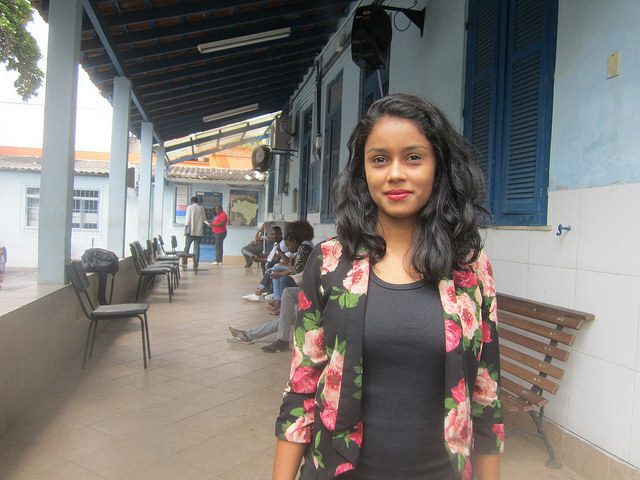 “Mawon is neither black nor white, it is Creole, meaning escape and now migration, diversity, mixture, and against racism,” defined Montinard, explaining that the organisation is active in social issues, welcoming immigrants and helping them get settled in Brazil, and also has a business side. “Migrants bring their culture, their food and their music. It is what they produce, share and sell in the destination country. Everyone wins: immigrants get an income, while they offer enriching knowledge for all,” he told IPS. 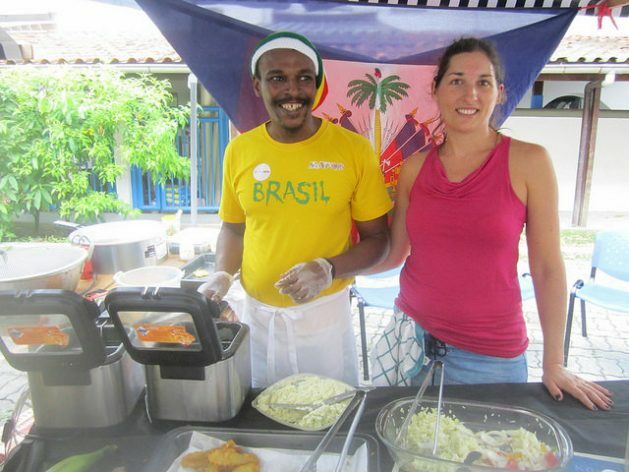 Cultural production is the best way to integrate immigrants, especially in Rio de Janeiro, he said while frying typical Haitian plantain snacks at a food stand. 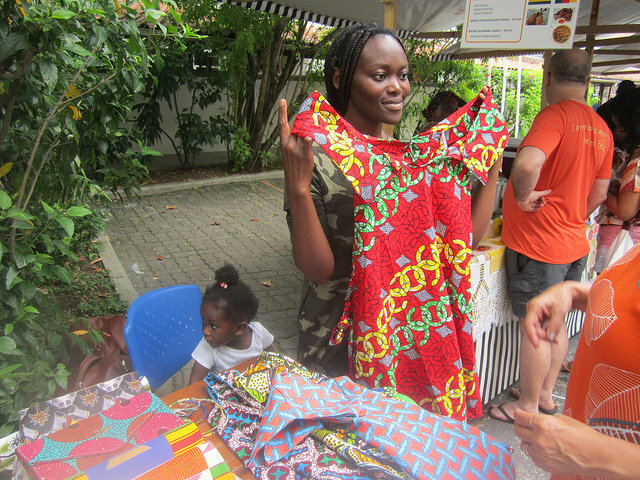 He was at the refugee food fair, held monthly in Botafogo, a Río de Janeiro neighbourhood, with support from the local Anglican church, which provides outdoor patios, from the Catholic organisation Caritas, and from the Local Board, a group that connects producers and consumers, to offer healthy meals at fair prices. In recent years there has also been an increased influx of Africans, such as Congolese and Senegalese, as well as Syrians, while more recently there has been an inflow of Venezuelans, all fleeing poverty or violence. In the past, the largest number of African immigrants came from Angola, a country that shares the Portuguese language, fleeing from the civil war that ended in 2002 after 27 years of conflict. There are also economic reasons behind the shift in immigration flows, since the 2008 international financial crisis weakened the appeal of the United States and Europe, while Brazil’s booming growth offered many employment opportunities, said Cavalcanti, who is also a graduate studies professor at the University of Brasilia. However, that scenario changed when Brazil fell into recession in 2015, and employment fell, which reduced the flow of immigrants, except for Africans. It also failed to curb the wave of Venezuelans, who, sometimes hungry, cross the border into the state of Roraima. This was the case of the couple who, with two young children and with her pregnant, sold their house in Venezuela to travel overland to Roraima, and from there by plane to Río de Janeiro, where they were assisted by Caritas, which helps refugees and migrants in several Brazilian cities. “We decided to leave because I didn’t have the food or vitamins to prevent my baby from being undernourished, and the children were only eating cassava and sardines. Our business went bankrupt because of inflation and we suffered threats because we were not supporters of the government,” said the woman, who preferred to remain unidentified because they still have family in Venezuela. Initially they received aid from Caritas, equivalent to 95 dollars a month for a few months, and Portuguese language courses. With her husband employed in a hotel, she hopes to “settle down and provide a decent life for our children,” who love the many playgrounds and beaches that they were unable to enjoy in their country. The IOM, which only opened its office in Brasilia in 2016, opened another one in 2017 in the capital of Roraima, Boa Vista, in the face of the humanitarian emergency situation arising from the mass flight of Venezuelans. Its Displacement Tracking Matrix platform began to be used in that northern state in January, to help the Brazilian authorities manage the influx, with clear data on the immigrants, Torelly reported. Of the 33,865 refugee claims in Brazil last year, 52.7 percent were filed by Venezuelans. Refuge for political or humanitarian reasons offers a path to legal residency in Brazil. It has been the means of entry for about one-third of foreigners in recent years. But few applications are approved. The National Committee for Refugees, the interministerial body responsible for the approvals, only granted refuge to a little over 9,000 people, and has more than 55,000 pending applications, according to Aryadne Bittencourt, legal protection agent for Caritas Rio refugees. A new law, passed in 2017, aims to facilitate immigration and refugee status, but the way it is being regulated would tend to continue imposing obstacles, as does the red tape, she lamented.